Note: Click links for the locations on Google Maps. The Uchaya-Udun is a detached royal residence built in 1677, for the sightseeing of the king, and for friendly reception and entertainment of Sappōshi and the like. In addition, since it is located east from Shuri Castle, chief investiture envoy Wang Yi in 1683 named it Tōen or Eastern Garden. In the Uchaya-Udun, various artistic performances were held, such as tea ceremony, flower arrangement, martial arts (bugei). In addition, many poems and Ryūka remain, such as Tei Junsoku’s “Eight picturesque sights of the Eastern Gardens”, by poets who visited here. 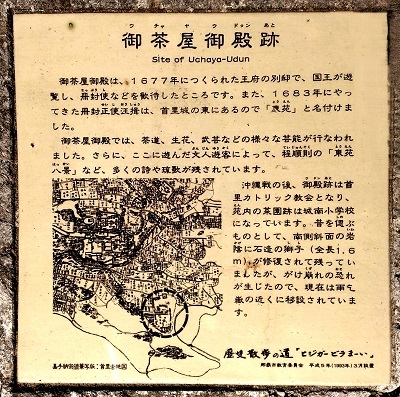 After the battle of Okinawa, the ruins of the Uchaya-udun became the Shuri Catholic Church, and the vegetable garden ruins became the Jōnan elementary school. As a remembrance of the past, a stone lion (1.6 m high) remained at the southern side slope, but since there was fear of a landslide, it has been relocated close to the Amagoidake hill.